[New for 2016] Yeah, I broke my every other day posting schedule again, sorry about that. It's been tough these last few weeks as there's just so little to choose from, life is in flux as school mode kicks back in, and allergies are beating me up. It's just one of those Wednesdays that feels like a Thursday even though it's kind of like a Tuesday and oh my brain is spinning too fast and I need ice cream. Wait, I know, I'll hit up Cumberland Farms and grab something cheap. plus candy coated chocolate - everybody's trail-mix favorites! 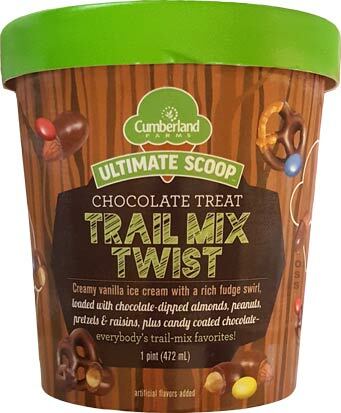 It's been several years since Cumberland Farms came up with this new Ultimate Scoop lineup. Nick started reviewing them at the end of 2013 but we just didn't make any headway after that, but let's see if we can fix that (or at least figure out if it's worth fixing). There are now 18 flavors in all with Trail Mix Twist being the newest member of the family. For whatever reason I thought these were $2.99 a piece, but it's now 2 for $7 (or $4.49 a piece). I guess I'm buying two so I can still call this a cheap snack. Besides the damaged area on the bottom of the picture, that is a pretty awesome opening shot. 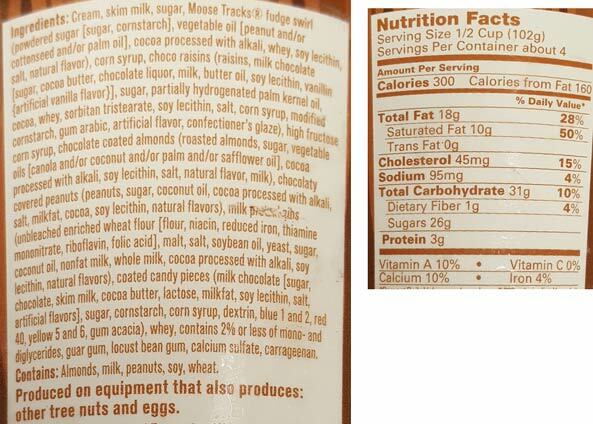 As I was getting ready to open the container, I noticed Moose Tracks fudge is #4 on the ingredient list and man does it make a great showing here. I can not wait to dig in to this one now. Man is this ice cream.... damaged. That's been the theme this summer hasn't it? The entire first serving is an icy mess. It tastes like ice milk and not ice cream and it's really effecting my enjoyment... not that it stops me from inhaling a second serving.... what? I had to get to a more representative section of the pint before writing a review right? Overall I really like the idea of this one, except maybe the chocolate covered raisins, those were a bad idea. They just didn't freeze very well and at one point I got a double raisin and it wasn't flavored well at all. It was spiced oddly. You are going to get some kind of chunk on every spoonful, but you won't know what the chunk is until you bite in to it. The pretzels and peanuts are enjoyable and do lay down a nice baseline of flavor that slowly builds as you go. I assume I ate some almonds at some point as well but I can't be sure. I also can't say that I tasted vanilla at any point but the swirl is pretty much everywhere so that's not surprising. Overall, I do have to give props to Cumby's for trying something like this. At some point every company wants to try some kind of "everything but the..." flavor and going with a trail mix theme was a fun choice. The hiccup ofcourse is the base ice cream or whatever bad conditions it has been subjected too. Hopefully the rest of the pint will be decent. 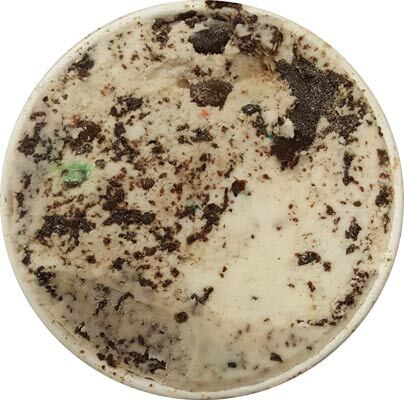 On Second Scoop: Doing a quick proofread of the first scooping (yes I actually proofread despite evidence to the contrary), I was noticing how grey that opening shot is, and I think it's a good summation of this ice cream. There is something not right with the base. Did they cheap out on the base and it came out as this grey icy concoction? If this had a decent base, this would be a big thumbs up from me. 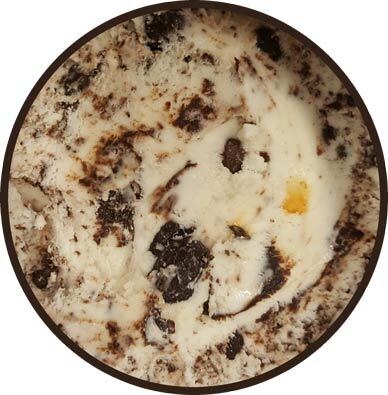 The mix-ins lessened a bit in the second half of the pint and the moose tracks fudge did it's best to shine through. They've got the right idea here, it just needs better execution. Ugh I feel your pain on the iciness... That's the worst!! This sounds so terrible...the idea of dried fruit in ice cream is not appealing at all. I know I'm "old-fashioned" but with the exception of some chips, m and ms, cookie dough, fudge, or brownie peices, I really just want the rest of the ice cream to be the stand-out...creamy as ice cream should be. I want ice cream with a little "stuff" not "stuff" with a little ice cream holding it together.